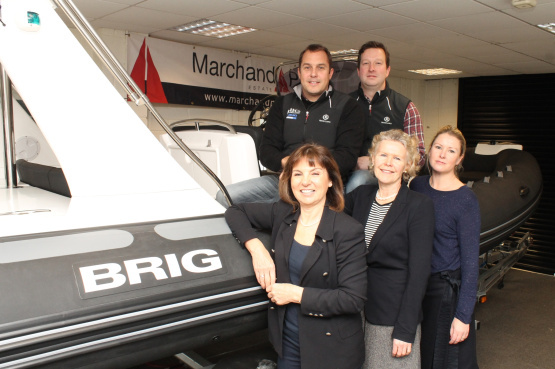 The Directors of Marchand Petit were delighted to join forces with local marine company The Wolf Rock Boat Company in January to showcase both company services and products to the London International Boat Show audience at Excel, London. Julia Pollard, Theodora Spink, Amanda Shock and Jane Summers from Marchand Petit joined Paul McCarthy and Nick Bailey of The Wolf Rock on the stand. The connection between the companies is of course the wonderful lifestyle opportunities available in the South Hams area of Devon, both on land and on the water. With many of Marchand Petit’s buyers coming from London and the South East of England - looking for both holiday homes and relocation – Marchand Petit’s six South Hams offices gained fabulous exposure for their clients, at this immensely popular annual event. Established with a strong coastal connection – in particular through their offices in Dartmouth, Salcombe and Newton Ferrers – and through their distinctive ‘red sails’ logo, Marchand Petit maintains its position as the premier South Hams estate agent by valuing this association with the boating community and also offering some of the best marketing and editorial output on behalf of its vendors. The company look forward to greeting new vendors and buyers at the Southampton Boat Show 16 -25 September 2016.